AdderLink INFINITY demonstrates Adder's leading IP capability by delivering fluid interaction with computers as far away as your network can extend. 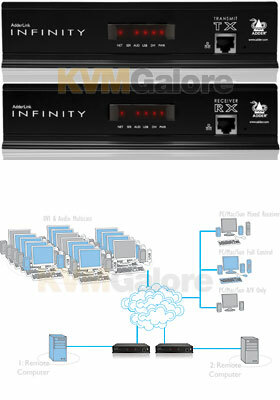 AdderLink INFINITY represents a major advance in the capabilities of digital extenders and switches. By encoding high quality DVI video, digital audio and USB connections into Internet Protocol (IP) messages, AdderLink INFINITY offers highly advanced and flexible signal switching capabilities. AdderLink INFINITY allows you to build a flexible infrastructure, the likes of which have not been possible before. Locate computers anywhere you like, share connections to computers, watch the interactions others have with computers, share control, collaborate, switch computers and so on. With AdderLink INFINITY, distance is finally no barrier to high specification, high performance computing. Furthermore, since all signals are now IP, the most elaborate and yet simple-to-use switching and multicast techniques make possible a great variety of uses. AdderLink INFINITY units come in two forms: a TX transmitter and an RX receiver. The former attaches to a single computer; the latter to your DVI video monitor, microphone, speakers and up to four USB peripherals. The distance between them is limited only by the size of your Gigabit Ethernet network. In addition to separating one computer and its peripherals, AdderLink INFINITY promotes sharing. You can arrange for a limitless number of screens and speakers, distributed anywhere across the network, to receive video and audio. You can also switch between any number of transmitter units from a single screen, keyboard and mouse in order to monitor a potentially vast collection of remote systems. AdderLink INFINITY is also the first device of its kind to allow multicasting across your network. Adder's expertise in IP based KVM solutions also means that you get the very best video quality and fluid USB based interactions with your computer. Adder's own USB True Emulation technology has also been built into the AdderLink INFINITY, allowing you to connect all HID (Human Interface Devices) as well as storage devices and many other USB device types too. Optimized for both HID and Mass Storage devices, the AdderLink INFINITY uses USB 2.0 technology to deliver reliable and flexible device support. All units feature browser-based configuration utilities to allow quick and easy set up, from near or far.